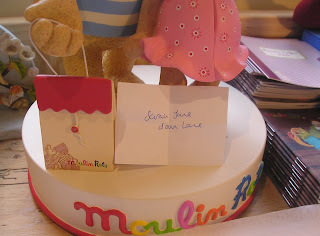 I've been thrilled by the response to the Maileg giveaway, and having had over 20 comments decided it was high time to pick a winner. Earlier today I wrote everyone's names on to little bits of paper, folded them up and placed them in Humphrey's dish (along with a couple of Naturals Carroty bunny treats!) hoping he might do something meaningful with one of them and therefore select a winner. He didn't. He just nosed them all out of the way to find his Carrotys. Useless. 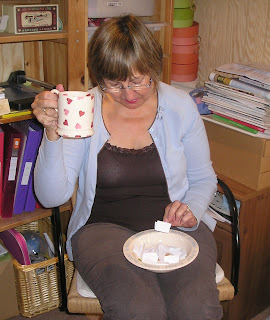 Time for plan B. Happily my mum was here this morning helping to pack up orders, so (much to Humphrey's irritation) I passed the dish over to her and asked her to pick out a winner. She had a much better grasp of the task at hand than Humphrey. Sarah, from Sarah Jane Down the Lane. Well done Sarah! I will send you a separate email anyway but please just send me over your address and I'll pop your lovely Maileg goodies in the post. And the good news for everyone else is that I have just set up another new competition on the website so there's another chance to win something lovely. I will write a separate post about the new competition later on, but for those who can't wait it is already up and running on the main Moulin Roty page of Cottontails. how sweet ! but mum to the rescue ! Haha...you can't trust a bunny to do a Mums job!! 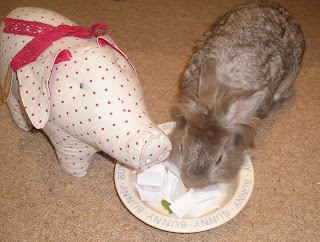 I think Humphrey wanted it to be me but in the interests of fair play thought your Mum should do the draw! Golly, I am very chuffed indeed, thank you so much Charlotte, I will send you an e-mail.